The Yelm School District Board this Thursday night will discuss the threatened condemnation of the Mckenna Elementary School building by Pierce County Fire Marshal Fred Smith, according to Dr. Glen Nutter, superintendent. The board will hold its regular meeting in the administrative offices, starting at 8 p.m.
Dr. Nutter said that the fire marshal examined the 54- year-old, two-story frame building towards the end of May (it is located just within Pierce County). Smith suggested three alternatives: replace the building (at about $400,000 said Dr. Nutter); remodel to provide fire walls throughout ($40,000); install a sprinkler system ($30,00). Dr. Nutter said the board and members of a citizens’ advisory committee have expressed reluctance to spend any considerable sum on the old building and would rather erect a new one if the voters approve. However, Nutter continued, the task of the board at the moment is to try to reach an agreement with the fire marshal on some kind of satisfactory, low-priced safety measure to take so that the district may continue to use McKenna School while seeking voter approval on building construction funds and then, if successful, erecting the new building – all of which takes time. The existing structure houses eight classrooms and an office. Dr. Nutter said the enrollment for this fall has been estimated at 180 students. Robert Edward Olson, age 81, greeted the world from the top of a kitchen table on July 15, 1925 in Montborn, Washington. He said goodbye from the living room of his Tumwater home on April 3, 2007. He and his two older brothers were raised on the shores of Borrows Bay, where they learned to work hard, play hard, and value family. Bob graduated in 1944 from Anacortes High School, where he played year-round sports and starred on the State Tournament basketball teams. After a stint in the United States Navy, he enrolled in the University of Washington and graduated with a Bachelor of Arts in Education. During his time at the University of Washington, he found time to play basketball with the Buchan Bakers. His teaching career began at Neah Bay High School, where he soon became principal and coached championship football teams. In 1958, he was hired as the principal of Yelm High School, where he served for 20 years. He retired from the school district in 1980. Dad was a beloved father and keystone for three families. He owned a boat years before he purchased a car and spent thousands of happy hours fishing. He loved the anticipation between the first bump of a curious fish lured to his bait and the solid pull from a hook well-set. The extended Olson families and the Yelm community have lost a “good man”. Bob was preceded in death by his son, Mark Edward Olson, first wife, Frances Ruth Crumb Olson, and second wife, Barbara Whitcomb Olson. He is survived by his wife, Cathy Olson; his children, Janet Olson MacGregor, of Seattle, Robert J. Olson, of Olympia, and Robert M. Olson, of Lacey; and numerous stepchildren, grandchildren, and great-grandchildren. Remembrances may be made to Dollars for Scholars in the name of Robert E. Olson, to Yelm Community Schools, or to Trout Unlimited. No formal services will be held. 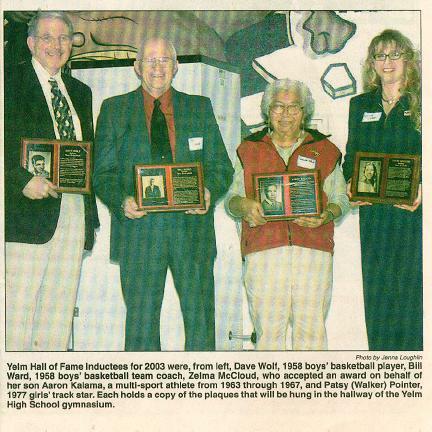 Yelm High School unveiled its new Hall of Fame with an induction ceremony during which three Yelm alumni were honored for their athletic ability along with one coach. Dave Wolf, center for the state champion 1958 boys’ basketball team, Aaron Kalama, 1963-67 multi sport athlete and Patsy (Walker) Pointer, 1977 girls’ track state champion were all chosen to bet he first athletes selected for the Hall. Bill Ward, also from the 1958 boys basketball team, was the first coach inducted. “These people show us that nothing is impossible when everyone works together,” said the high school’s Athletic Director Ron Barnard. Each inductee was given a plaque with their high school senior picture and a brief paragraph describing their achievement, a duplicate of which will be hung in the gym hallways by the boys’ and girls’ locker rooms. Before the honorees themselves were handed the microphone, someone introduced them to the crowd. For Ward, Wolf gave a description of what it was like to have him as a coach. Ward then talked about the season and what made the team so special. “We had to win 17 straight games to get the title,” he said. Next, a quite excited Bob Wolf came up. “I’ve waited so long to roast him,” Bob said of his younger brother Dave. However, Bob was rather nice, describing what life was like in Yelm during the 1958 run along with the accomplishments of his brother. “Yelm closed down,” during the 1968 playoffs, Bob said, adding that throughout the whole season, his parents store, Wolf’s Department Store, had a window dedicated to the team, posting its record and game scores. He also mentioned Dave’s being named to the All-state team, his time spent at Stanford and the University of Puget Sound on a law degree and most recently, the failing mill he purchased in Oregon that he has turned into a success. “You’ve been a real inspiration to me,” Bob said. Dave joked that, even though it might seem like it has, not much has changed. Kalama’s mother, Zelma McCloud, accepted the award for her son who was tragically killed in a car accident two years after his graduation from high school in 1967. Superintendent Alan Burke remembers Kalama’s reputation as the two were in high school at the same time, though in different districts. “He was about as good as anybody around here,” Burke said. “He loved playing sports,” McCloud said. “It came to him naturally.” McCloud also said that Ward was probably one of Kalama’s favorite coaches. “I am grateful for this honor and grateful for the school to remember him,” she said. Strand listed off numerous records Pointer set, many of which are still standing, and wondered how much better they could have been if the track had not been made of cinder. “She was something that was really great,” said Strand. “I couldn’t have done it without the support of my community,” Pointed said, after which she got a little chocked up and teary eyed. “She’s never at a loss for words at home,” joked her husband, Gary Pointer. “I was scared to lose,” Pointer said. shall not be permitted; otherwise dress and appearance are the responsibility of parents. board elected but not certified, was present and indicated he would vote for the measure. the room emptied to the normal complement often visitors. Yelm’s Southworth Elementary School, an attractive structure which shows no scars from its sometimes stormy past, will be dedicated Tuesday, Nov 23, in festivities which include an all-day open house followed by a ceremony and program starting at 7:30 p.m. The evening ceremony will be held in the bright new cafeteria. Principal Jack Coates, serving as official host, will introduce guest speakers. Among these will be the man for whom the school was named: Harry Southworth, who started his Yelm area teaching career in 1932, in a two-room school in Evergreen Valley. 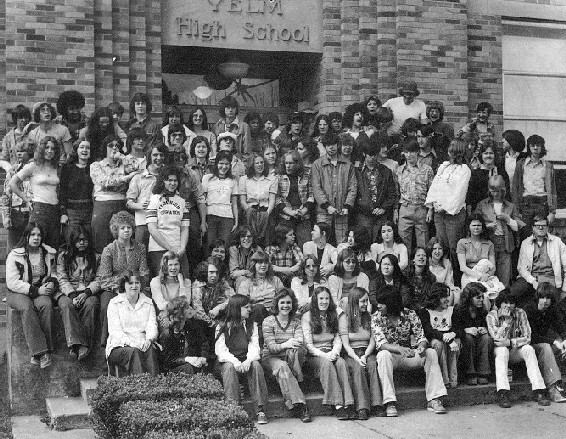 He went to the old Yelm Grade School in 1935 and served there as a teacher and then principal and then teacher again, for the next 38 years – until1973. From his principal’s post he returned to teaching five years before his retirement, “after it got to be too much of a headache to be an administrator,” Southworth said. Another distinguished guest, and principal speaker at the dedication program, will be State Superintendent Frank Brouillet. Others will be Fran Brock, chairman of the school board; Yelm Mayor Lora Coates and District Supt. Glen Nutter. Following the dedication program, guests may tour the building and return to the cafeteria for refreshments to be served by members of the parent-teacher organization. A part of Southworth was built in 1971, partly with monies from a $700,000 bond issues passed by the district. As a result of controversy regarding the location of the school building, it was not equipped and occupied upon completion of its first phase. The school was furnished the following year, however, and was used. A second bond issue – of $2.5 million – passed last year included money for the completion of Southworth. Coates said its total cost was about $1.3 million. It serves about 450 students in four pods of four rooms each, with skylighted library, excellent gymnasium (soon to be shared with the high school!) and cafeteria. The buildings, grouped around the library and a surfaced patio playground, are girded by turf stretching away to nearby woods. Muted pine-green siding and mottled brown shakes suit the environment. Pitched roofs slope to cloche-like eaves. Within the several pods, rooms open into each other and each unit has its own bathroom. However, the pods are connected to each other and to cafeteria, library and gym, only by way of covered and protected outside breezeways, skylighted here and there to lighten them on winter days. The cafeteria is fitted with a satellite kitchen, but hot lunches are catered from Yelm High School. Principal Coates said Southworth children seem to lime the school and are not bothered by having to go out of doors to reach cafeteria or library or office. Architects of the first portion of Southworth were Olson and Rowe, Olympia; of the second part, Don Bogard of Kent. General contractors were the Korsmos of Tacoma. Introduction: The following material was taken from high school annuals from the period. No attempt has been made to distinguish head coach from the rest of the coaching staff. Introduction: The following material was taken from Y.H.S. annuals from the era.